1.5 billion beverage bottles are purchased each year in Minnesota. 15,000 will be purchased during the 5 minutes it takes to read this newsletter. With these kinds of numbers, you can understand why our everyday choices about beverage bottles add up. The small decision to use a reusable bottle filled with tap water, instead of a single-use water bottle that is tossed in the garbage, will reduce energy consumption by 85% and greenhouse gases by 79%. Drink tap water. Bottled water costs as much as $10 per gallon compared to less than a penny per gallon for tap water. In addition, federal water quality standards are usually more rigorous for tap water than for bottled water. Those concerned with taste or quality can also add a filtration system. Read about filters in the EPA's Filtration Facts (pdf). Buy only 1 or 2 reusable water bottles and use them frequently. Reusable water bottles are "in" right now, and come in fun colors and patterns. If you buy too many, though, you'll reduce the benefit of using a reusable bottle. Spread the word by using posters, activities, and links provided by the City of Minneapolis on TapMpls.com. Recycle every bottle you buy. Only 24% of bottles are recycled by Minnesotans every year. Make a commitment to recycle 100% of your plastic bottles even if that means carrying it home to recycle. Your good example will be noticed. 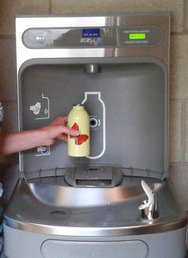 Single-use bottles are in demand as a material to make new things. Plus, recycling saves energy, makes jobs, and feels good. Start or improve the recycling program at your work or school. The Recycle More Minnesota website has a toolkit for schools. RethinkRecycling has resources, too. The Northland Bioneers Conference is a local event featuring the plenary presentations from the National Bioneers Conference via DVD, hands on workshops and facilitated solutions-focused dialogues about sustainability, November 10, 8:30 a.m.-9 p.m., Macalester College (St. Paul). Considering renewable energy at your home? Start by attending the free Solar Works! in Edina workshop. You'll get solar basics, rebates, and resources to get your project started, November 15, 7-8:30 p.m., Edina City Hall. Mark your calendar for the 7th annual Green Gifts Fair, where you can find unique eco-gifts for the holiday season, November 17, Midtown Global Market (Minneapolis).